About | We Can Do It! Si Se Puede! Women's Cooperative, We Can Do It! 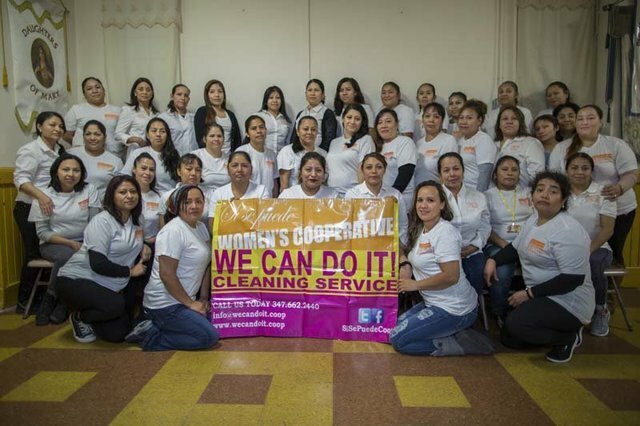 Inc.was founded in Sunset Park, Brooklyn, in August, 2006, to bring together immigrant women to create a women-run, women-owned, eco-friendly housecleaning business. The cooperative is designed to create living wage jobs that will be done in a safe and healthy environment, as well as to provide social support and educational opportunities for our members. We have over 100 members (as of April of 2018), all of whom have completed a probationary training. All of the members, who are also immigrants, have an equal voice in decisions regarding policies and operations. In addition, members work together to promote the business and meet bi-weekly for on-going training and support. The 14 founding members chose the name Si Se Puede! Women's Cooperative, We Can Do It! Inc. because we feel that it embodies the spirit of the group. “Si Se Puede!” also has resonance for many of our members, as the phrase is often heard in political and social change movements throughout Central and South America. Si Se Puede! works in mutual support with Center for Family Life in Sunset Park, a nonprofit community-based organization providing social services for children, youth and families in Sunset Park, Brooklyn, since 1978. ¡Si Se Puede! in the News!